Hello lovelies! Now that it's after Memorial Day, the summer has unofficially started. If you're anything like me, this means that you're about to start a summer-long Netflix binge (or at least have several lazy days). Since a lot of you are eagerly waiting to be 1Ls this fall, I thought I'd give you a little list of my favorite law TV shows to get you excited for law school! Pro tip: invest $40 and get an Amazon Fire TV Stick and then you can watch all of these on your TV because this comes with Netflix and Amazon Prime. 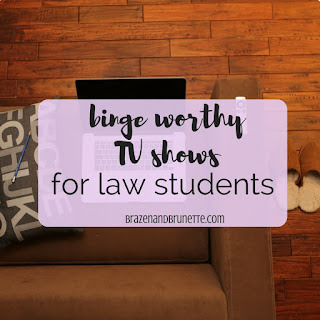 I'm putting this first because my Criminal Law professor actually emailed the class and recommended that we watch it and we talked about it in class just because it's such great lawyering. Even if you know that you have no interest in being a criminal lawyer or a prosecutor, it's got some legendary lawyering in it. The law nerd in me seriously got so excited when a side would come up with an out-of-the-box argument that it definitely will get you pumped to start your law career. This is also a great series to get you nerdy-excited about the law. It starts off slow but I promise you there will be points when you're in awe at the lawyering skills. When Steven's lawyer would come up with a unique way to gather evidence, I was seriously inspired. Because this is a documentary, you begin to see just how valuable a lawyer can be. If you liked Breaking Bad and you like the law, then you'll love this series. My favorite part about it is how it portrays the honest side of what it's like having to hustle to get work as a lawyer. It also is very real about how people perceive law school rankings. If you're thinking of maybe starting your own firm after law school or even working at a tiny firm, it shows the dedication and work ethic that you'll need to be successful. I'm actually watching this right now, thanks to a recommendation by one of my friends. So far, I like how it makes you want to get good grades so that you can be a powerful lawyer who's not only a playmaker, but also a badass. It has some great business profession attire inspiration and also some great quotes about being a lawyer. The only downside is that it's a tad ridiculous because most people work in those big corporate law offices for years before getting a junior associate title or an office, so if you go this route just expect to be stuck in the bullpen. I'll start right off and say that this show isn't really all that realistic. Don't expect your 1L year to be you jumping right in on how to defend a client. You gotta ease in to it and first learn the basics, like the difference between the levels of murder and manslaughter for example. But I like how this does showcase some of the pressures that you're under when you have outlines and readings to do on everyday. And again, you need to be able to think on your feet to be a killer lawyer. This show is more about this girl's life than it is about lawyering, but I still like it. Again, just watching people fighting zealously for their clients can really get you pumped about wanting to be a lawyer and help people. I also like it because it has a little bit of Legally Blonde attitude in it because she breaks the mold of what a typical lawyer is presumed to be. Ok, confession—I haven't watched this yet, but it's at the top of my list to watch because another one of my friends told me that I'd love it. It's supposed to be loosely based on the Bill Clinton scandal, but the main character is also a lawyer so I'm betting that it will be pretty great. Just want to say that I love your blog! I am beginning my first year of law school on the 22nd making every thing you post great. As for shows about law I have fallen in love with the show Damages, its a little intense but all good law shows are! I LOVE the Good Wife, honestly one of the best shows out there!! Have you watched it yet? What do you think? In the interest of full disclosure, you'll fall in love with the show, but the last season of the show is poorly written. If you are looking to get into a good law show, on ABC they just started "For the People". Yesterday they just had episode 4 so it would be easy to catch up. Who are your favorite characters ?